Congratulations to U-32’s State Winners of the Vermont Letters about Literature Competition! Katie Phillips won first place in the state competition with her letter to Katherine Patterson. Charlotte Bodin won second place in the state competition with her letter to George R. R. Martin. Avery Ehret won third place in the state competition with her letter to Michael Buckley. These excellent writers will be honored at a ceremony at the Vermont Statehouse on May 25th. Katie’s letter has been entered into the Library of Congress’ national competition. Those results will be reported in the coming months! Two talented Berlin Elementary School students also won awards in the Vermont Letters about Literature Competition. 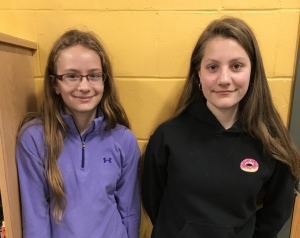 Isabel Moustakas’s (6th grade) letter won third place in the state competition and Tiahna Hallock’s letter won first place in the state competition! Both girls have been invited to attend a ceremony in their honor at the Statehouse. Tiahna’s letter has been entered as Vermont’s pick into the national contest. Good luck Katie and Tiahna! Congratulations to Berlin Elementary’s Jr. Iron Chef Teams! 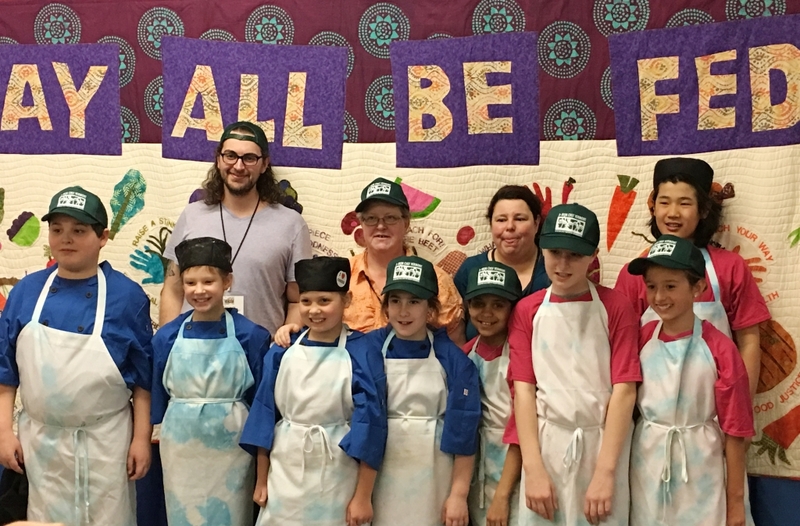 On Saturday March 17, 2018 Berlin Elementary School had two teams of students compete in the 11th annual Vermont Jr. Iron Chef. The first team, Italian Bobcats, created Spaghetti Squash Lasagna. The second team, PAWsitive Pizza, presented a “Rainbow” Vegetable Pizza to the judges. Both teams put forth an amazing effort, and the Italian Bobcats took home the Crowd Pleaser Award for best tasting dish. On Thursday, April 12th the Italian Bobcats and their coaches went to the Statehouse where they were recognized. 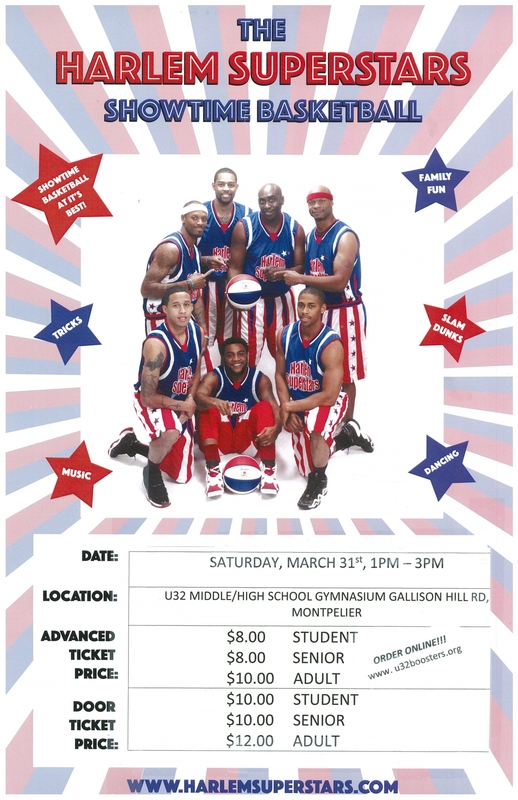 The students were very excited for this opportunity and were the youngest team present at this wonderful event. While there the team served their dish to a room full of Representatives and were presented with a proclamation which will proudly hang in the Berlin Elementary cafeteria to hopefully inspire more students to become Jr. Iron Chefs in upcoming years! 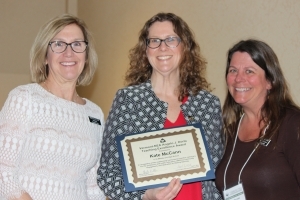 U-32 teacher Kate McCann was presented with the Angelo J. Dorta Teaching Excellence Award at the Vermont NEA Awards Ceremony at the Stoweflake Resort on April 7. 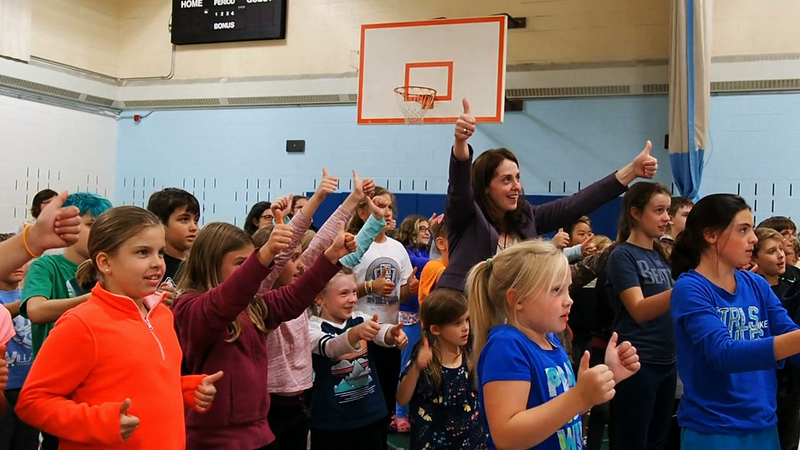 As the 2018 Vermont-NEA Angelo J Dorta Teaching Excellence winner, Kate has been recommended by Vermont-NEA for the national NEA Teaching Excellence Award. Kate McCann, center, is presented with the Teaching Excellence Award at the Vermont-NEA Awards Ceremony April 7. Kate was recently named an Albert Einstein Distinguished Educator Fellow for K-12 educators in the fields of STEM. She also is the recipient of the AOE Vermont Teacher of the Year award in 2017, the Presidential Award for Excellence in Mathematics and Science Teaching 2015, and National Board Certification Adolescence and Young Adulthood Mathematics. 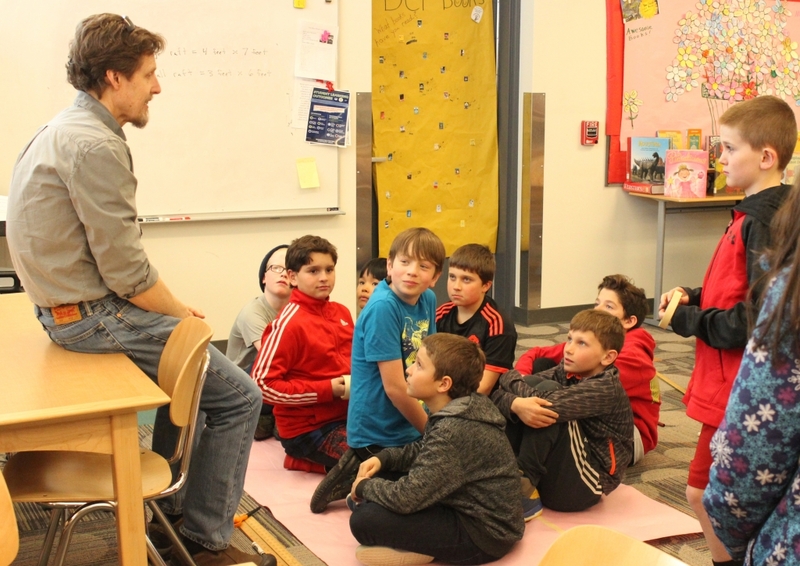 East Montpelier fourth, fifth and sixth graders have been enjoying book club this year. Students have been meeting regularly in the evening since school started. 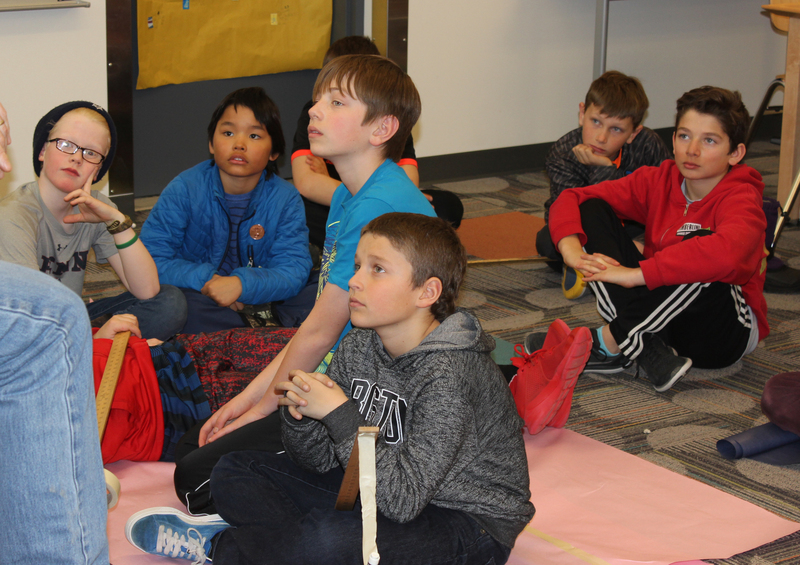 Hosted by library teacher Arlyn Bruccoli and fifth and sixth grade teachers, Ellen Shedd, and Claire Gallagher, students have read books that are nominees for the Dorothy Canfield Fisher Book Award. About a dozen plus kids come each week to do activities connected to the books, talk about the books, and have a snack. On March 20th, Lost in the Pacific, 1942 author Tod Olson (who lives in Middlesex) came to the book club and shared what inspired him to write his nonfiction “Lost” survival story series. When he was their age, he read the book Alive about a rugby team from Uruguay whose plane crashed in the Andes Mountains. He was so enthralled he read the whole book in two days! Ever since then, he’s wanted to write stories that kids find riveting. Author Tod Olson describes his motivation to write nonfiction survival stories for children. Observing the students’ engagement as he presented, it’s clear that he’s certainly accomplished that with the book Lost in the Pacific, 1942. Students asked question after question of Olson who made the story come to life for the nine, ten, and eleven-year-olds. To go along with the harrowing true story of how eight men in three tiny inflatable rafts, lost in shark-infested Pacific Ocean without food or water near enemy-held territory survived three weeks before being rescued, the teachers planned an activity where the students created life rafts out of large sheets of paper. They imagined what it would be like to be in shark-infested waters. Lost in the Pacific, 1942 is the first in a series of adventure stories Olson has written. There’s also Lost in Outer Space, about the Apollo 13 moon mission, and the third book is Lost in the Amazon, about a teenager who falls from a plane and has to survive on her own in the rainforest. A fourth book is in the works and Olson promised to send the students a picture for them to try and figure out what the book is about. 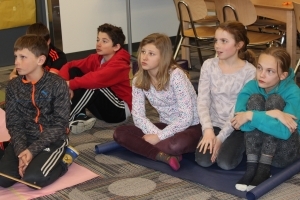 To view a WCAX piece about how Olson is inspiring reluctant readers to read – that highlights an East Montpelier boy – click here. Kathy Topping, Orli Schwartz, Mark Chaplin, Eliza Merrylees, Anna Davis-Noe. Mark, who has taught science at U-32 for 45 years, has been coaching cross country since 1973, as well as track, and Nordic skiing. He also coached girls’ basketball for the first two decades of his work at U-32. During this time Mark’s teams have been in the top two in the state over sixty times. Read more about Mark’s success in the current issue of the U-32 newsletter. U-32 has a new newsletter. Read about current and former students doing great things here. Rumney Harvest Dinner A Success! This year’s 11th Annual Harvest Dinner brought community members together at Rumney Memorial School. 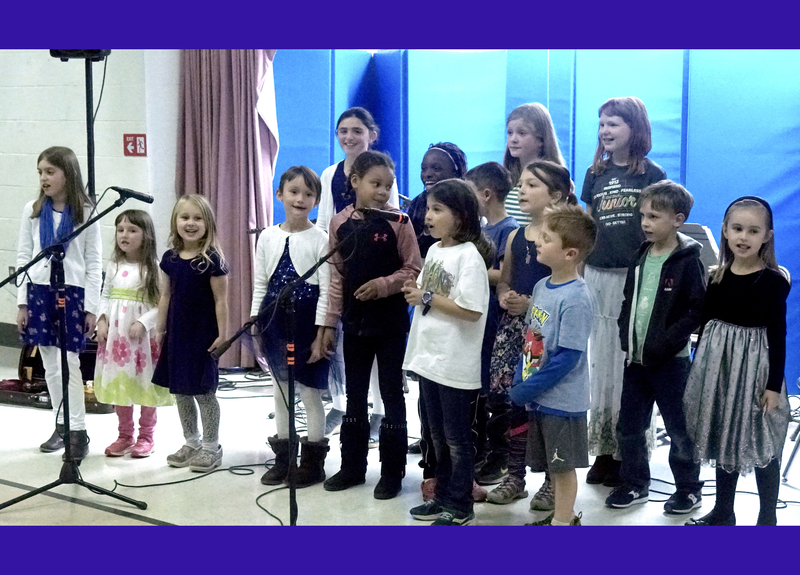 Rumney School children sang “Gratitude Attitude”, under the guidance of their music teacher Kara Krikorian. Along with the delicious dinner of soup, salad, roasted veggies, applesauce, bread, and pies, there was wonderful entertainment, a raffle and a silent auction that included local art work, hand knit items, gift cards, toys, books, and much more! Thank you to this year’s sponsors: Bear Swamp Veterinary Service, Noyle W. Johnson Insurance Agency, Capitol Copy, Hunger Mountain Co-op, Middlesex Plumbing and Heating, Sticks & Stuff, Middlesex Electric, and Bolduc Auto Salvage. If you are interested in learning more about how you can help the Middlesex Food Shelf or would like to make a donation please contact Ethan Scharf at escharf18@wcsu32.org. Doty Pre-K teacher Christina Strobridge and U-32 English teacher Jenn Ingersoll were named U-32 Teachers of the Year at a ceremony at the 37th Annual UVM Outstanding Teachers Day, October 12. Christina was nominated as she “is a fierce advocate for early childhood education in general but even more so for students at Doty Memorial in Worcester.” This past year she increased participation in Doty’s Pre-K program by over 60% by making it more accessible for families. She is a voracious lifelong learner, seeking out opportunities for growth and emerges excited to implement what she has learned in her classroom. The hallmark of her contributions is the relationships she forms with families during their student’s critical earliest years of school. She carefully and skillfully navigates even the trickiest situations to arrive at a foundation of trust and respect throughout their schooling. Before taking over as principal at Rumney Memorial Elementary School in July, Aimee Toth had been the principal at Roxbury Elementary, worked on literacy professional development across Vermont including in Montpelier and Woodstock, had spent twelve years in the classroom teaching both second grade and kindergarten and was the Associate Director for Elementary Education at Upper Valley Educators Institute, providing teacher training. Toth has a Master’s degree in Curriculum and Instruction. Toth, who loves her new job at Rumney, says the biggest challenge administrators have is making sure to be mindful of the resource of time and that it’s being deployed in the most effective way. She says there is a higher degree of collaboration between teachers, than in the past. And, that it’s important time to work together, including working with parents as partners. Rumney staff is looking for new ways to partner with parents, including the recent class meeting night. 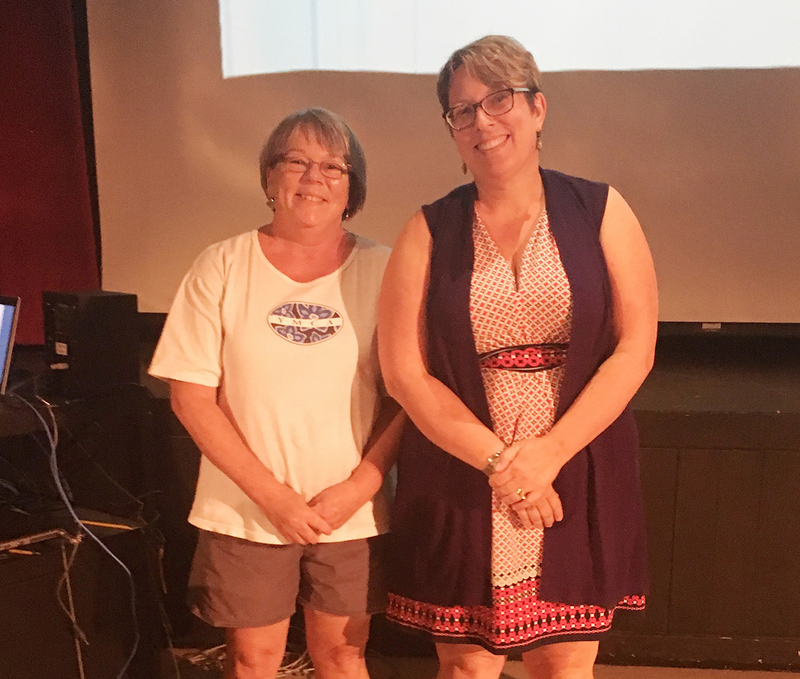 Teachers shared information with parents explaining what would be covered in each class including specific information about how parents can help to support their kid’s education. Toth has also initiated monthly “coffee talks” where parents can come to give feedback and ask questions, the last Friday of the month from 8:45-9:30 am. Outside of work, Toth loves a good project, loves to paint, likes spending time with friends, and she loves to can. Just last week she canned a full bushel and a half of apples into applesauce! She finds Middlesex to be a community that truly cares about the kids and the type of education they’re getting and she’s looking forward to getting to know the community better and to allow the great teachers and students to be everything they can be. Welcome Aimee Toth!